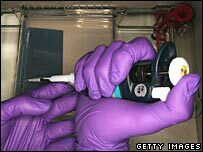 US President George W Bush has urged manufacturers of bird flu vaccine to increase production, as concern rises about a potential epidemic. The president met drug firm chiefs as officials from 80 countries and the UN met to try to plan a global approach to any pandemic. Last week, the Senate released $4bn for the purchase of anti-flu drugs. Mr Bush recently suggested that the military could enforce quarantines in affected areas in the United States. Mr Bush's comments are further evidence that avian flu has risen close to the top of the White House agenda, says the BBC's James Coomarasamy in Washington. "There's no secret about the fact that our vaccine manufacturing capacity domestically is not what we need it to be," Health and Human Services Secretary Mike Leavitt said, the AFP news agency reported. "We've got to improve in that area," he said. The US is using the conference in part to stress the need for all countries, including those with less than transparent track records, to share information at the earliest possible stage. In recent weeks, senior officials here have embarked on a public information campaign, warning of the possibility of a lethal pandemic which could claim millions of lives. There is concern that a repeat, for example, of China's initial reticence to report the scale of the Sars epidemic three years ago, would on this occasion have huge implications for mankind. Romania reported its first case of bird flu on Friday, after three ducks were found dead in the Danube delta. It is not know whether it was the deadly H5N1 strain circulating in parts of East Asia, which has killed 60 people in the past two years. There is no evidence so far of human to human transmission of the strain.